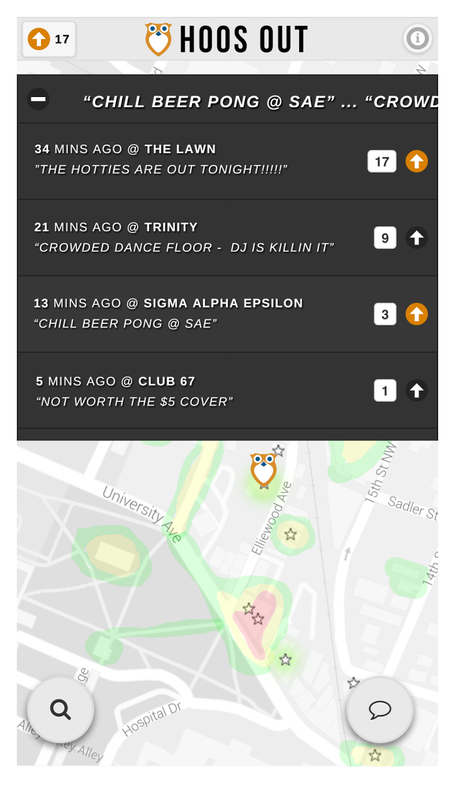 Hoos-Out is a realtime view of the social world around you. See where people are hanging out! See where the party is! See which study spaces are empty! See what your peers are saying! Hoos Out tonight? Screenshots of the app in action from the beta. Other members of my team have expressed concern over posting actual code for legal sourcing issues, so out of respect for them, I cannot post any here. However, I would be more than happy to walk through how the application works; just shoot me an email under contact. Under the screenshots are links to articles form Hoos-Out's launch from The Cavalier Daily, The Tab, and WUVA Online.